Virginia Beach City Public Schools (VBCPS) is the second-largest school district in Virginia and one of the 50 largest school districts nationwide. As part of its strategic plan to cultivate accessible learning environments, the district wanted to explore its discipline practices to identify areas where alternate measures could lead to improved outcomes for students and staff. VBCPS asked Hanover to investigate restorative practices, an emerging trend in schools looking to avoid taking students out of the classroom as punishment for misconduct. To provide a detailed review of what restorative practices look like, Hanover examined existing literature, identified common challenges, and evaluated different implementation approaches. 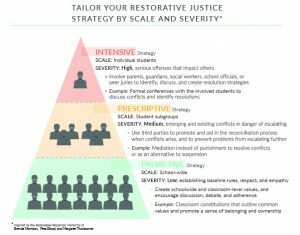 In reviewing restorative practices, Hanover found that the most effective restorative justice programs employ a series of strategies that build on each other, tailoring their discipline to the scale at which misbehavior occurs and the severity of the infraction at hand. Our department faced a temporary staffing shortage when a team member went on maternity leave. During her absence we needed a reliable partner to help us with numerous research requests, and found a true partnership with Hanover. We were so pleased with Hanover’s work we continued our partnership—even after our staff member returned from leave.